Learn about the 18'th Dynasty. See Ian Bolton's pages on KV 55. To compound the ancient damage, Davis, eager to settle an argument with Arthur Weigall and Maspero concerning the mummy's identity, had the body hastily exposed in the tomb so that its gender could be determined by two visiting doctors from Luxor. Davis's account of the mummy's "examination," published in The Tomb of Queen Tiye (London , 2), describes how one of the teeth of the mummy fell to dust when he touched it and relates that the bandages, rendered extremely fragile (supposedly by the water damage), were simply removed from the body piecemeal in the tomb itself. American artist Joseph Lindon Smith, who Maspero nominated to remove the bandages, described them as crumbling to dust in the process: "No sooner had my hand touched the surface of the mummy than it crumbled into ashes...nothing remained except a pile of dust and disconnected bones..." (TTAA, 64.) Egyptologists today are dismayed by such hasty and careless methods, which destroyed more valuable historical evidence than they revealed. Along with the mummy and the objects discussed above, KV 55 contained disassembled panels from a shrine (similar to those found surrounding the sarcophagus of Tutankhamen) that had been inscribed for Queen Tiye. 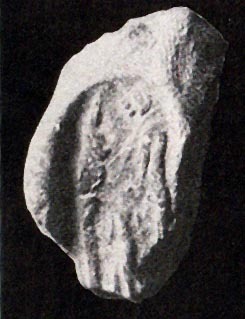 Four calcite canopic jars found in a large wall niche all had stoppers carved in the likeness of a woman shown wearing a wig identical in style to that which appeared on the coffin. 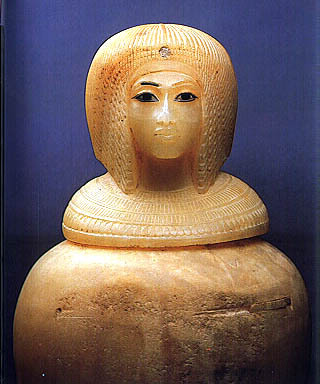 (See photo of canopic jar [from EMC-87, no. 171.] Additionally, Tiye's name (as well as that of her husband, Amenhotep III) appeared on several of the smaller items scattered throughout the tomb (TTAA, 60.) Davis concluded that the mummy was that of Queen Tiye herself, and became infuriated when Weigall disagreed with this identification (and also when Maspero refused to take a side in the argument.) In order to prove his point, Davis called in a Dr. Pollock and an unidentified American obstetrician to examine the mummy and help determine its gender. (For Dr. Pollock's name, see Reeves, DRN, 44, and n. 170.) The doctors briefly examined the skeletal remains and pronounced them to be those of a woman. Feeling vindicated, Davis announced to the world that he had discovered the tomb of Queen Tiye. Although Smith himself did not think the evidence in favor of his earlier age assignment was weighty enough to prevent identifying the mummy as the Heretic Pharaoh, others (who perhaps attached undue importance to interpretations of epiphyseal data and other anatomical dating methods) point out that Akhenaten had to have lived beyond 25-26 years, and so have looked elsewhere for the identity of the KV 55 mummy. Douglas Derry (ASAE 31 , 115ff.) intensified doubts about the mummy's identification as Akhenaten by giving it an age estimate of 23 years, an estimate even younger than that originally provided by Smith. Thorough radiological examinations of the KV 55 mummy, conducted in 1963 by R. G. Harrison, A. Batrawi, and M. S. Mahmoud (JEA 52 , 95-119) pushed the age-at-death estimate for the mummy to 20 years, much too short a span of life for Akhenaten but one quite consistent with the few known facts about Smenkhkare's brief life. The similarities between the skulls of the KV 55 mummy and Tutankhamen strengthened the argument that KV 55's mysterious occupant was the young man who many experts believe was Akhenaten's co-reagent and Tutankhamen's older brother. Norman de Garis Davies had been the first to propose that the KV 55 mummy was Smenkhkare (cf. AKoE, 200,) a suggestion which was consistent with the mummy's age estimates as given by Smith (and, later, Derry). 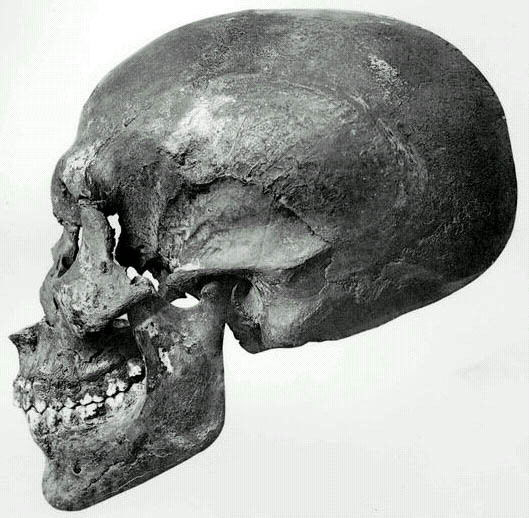 Harris and Weeks also favored identifying Smenkhkare as the KV 55 mummy, and state that their examination revealed the bones to be that of a young man with no signs of hydrocephalus or any other pathological condition that could complicate anatomical age estimates. (XRP, 143-149). Serological testing indicates a first-order (brother-to-brother or father-to-son) relationship between Tutankhamen and the KV 55 mummy (Nature 224 , 325f. ), and the balance of the medical evidence strongly suggests that Smenkhkare was the person found in KV 55. However, not everyone believes that the KV 55 mummy is that of Smenkhkare, the most notable dissenter to this view being C. N. Reeves, who has argued that "estimates of age at death based upon anatomical development are of quite doubtful reliability," (DRN, 49; see also Robbins in GM 45 , 63ff.) Reeves contends that Akhenaten was the person found by Davis in KV 55. Various scenarios have been proposed to account for the unusual assortment of objects found in KV 55. Aldred's reconstruction (AKoE, 206ff.) explains the tomb as a cache which at one point contained the mummies and some of the burial equipment of Tiye, Akhenaten and Smenkhkare, all placed there by Tutankhamen sometime after the abandonment of Akhetaten. At some point, the decision was made to remove Tiye and Akhenaten, and so KV 55 was entered again. Tiye's shrine (which Aldred feels had been erected and put in place around Tiye's coffin) was disassembled, defaced, and partly moved out of the burial chamber. Meanwhile, an attempt was made to erase Akhenaten's name from other objects remaining in the tomb, including the coffin which was eventually found by Ayrton and Davis. This coffin (which Aldred believes contained the mummy of Akhenaten at this point in his narrative) had its cartouches cut out and its golden face ripped off. 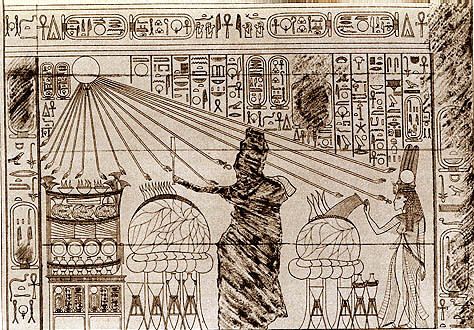 Aldred proposes that Akhenaten's mummy was then removed from the coffin and replaced by the mummy of Smenkhkare. The shrine, either because its sections were were too difficult to remove or had already sustained water damage, was left behind in KV 55 along with Kiya's/Akhenaten's coffin, the mummy of Smenkhkare, the defaced canopic jars, and other small artifacts. Tiye's mummy, coffin, and other funerary objects were taken out of the tomb, along with the coffin of Smenkhkare, presumably now containing the mummy of Akhenaten, and the tomb was resealed and forgotten. A major problem with Aldred's account is his seemingly ad hoc substitution of Smenkhkare's mummy for the mummy of Akhenaten which he claims originally lay in the KV 55 coffin. If the intent had been to remove Akhenaten from the tomb at all, why not carry him out in his own coffin? And why leave Smenkhkare behind in the dismantled and ritually desecrated tomb? Akhenaten would seem to be the most logical choice for abandonment in such a sepulcher, unless, of course, his mummy was removed from KV 55 so that it could be destroyed. Admittedly, Aldred's scenario accounts for the confusing disposition and nature of the objects found in KV55, but raises other questions that seem equally baffling. The reconstruction of events in KV 55 given by Reeves (DRN, 42-49) eliminates the "Third Man" (Smenkhkare) from the argument altogether, and focuses exclusively on Tiye and Akhenaten. Like Aldred, Reeves dates the initial employment of KV 55 for the caching of Tiye to the reign of Tutankhamen due to the numerous clay seals bearing Tutankhamen's name which were found in the tomb. Akhenaten's mummy, contained in Kiya's modified coffin, was later placed in KV 55, along with Akhenaten's magical "bricks" and (presumably) Kiya's reused canopic containers. At a later date (which Reeves places at sometime before the end of the 20'th Dynasty based on KV 55's overlay of rubble from the quarrying of later tombs) the tomb was entered and Tiye's mummy, coffin, pall, and other small funerary items were removed for caching elsewhere. The shrine was defaced and abandoned in KV 55 along with Akhenaten's mummy in Kiya's reused coffin, from which the cartouches had been cut. Although the simplicity of Reeves' account has appeal, it seems unable to account for anatomical data derived from detailed examinations of the KV 55 mummy. As stated above, this data indicates that the mummy was of a man who died between the ages of 20 to 26 years. Most historians are unable to compress the life of the Amarna king into such a short span, and identify the KV 55 mummy as Smenkhkare. Among the major factors contributing to the puzzling features found in the early post-Amarna period deposits in the Royal Valley were the unexpected deaths of Smenkhkare, Tutankhamen, and Ay after only relatively short periods upon the throne. None of these kings reigned long enough to have had sufficient time for the preparation of traditional royal tombs or the completion of finished funerary ensembles, and so the frequent reuse and modification of burial equipment undoubtedly occurred. This procedure entailed reentering original burials, moving grave goods to transitional locations selected for convenience, and refurbishing items (such as the KV 55 coffin, originally designed for a female) in ways that made them reusable in other interments but very bewildering to Egyptologists. The following reconstruction of events in KV 55 focuses on the reuse of some of Smenkhkare's grave goods in Tutankhamen's tomb. Any account of KV 55, the final resting place of the mummy which is most probably Smenkhkare's, should offer some explanation of how grave goods belonging to this mummy ended up in KV 62. Rex Engelbach (ASAE 40 , 137f.) argued that some of Tutankhamen's inscribed mummy bands, his four canopic coffins, and his third shrine were all originally designed for Smenkhkare. Tutankhamen's second coffin is seen by Dodson and Ikram as also deriving from Smenkhkare's funerary ensemble because it differs stylistically from his outer and innermost coffins. (MiAE, 214. See also Partridge, KMT [8:1], 66; and Vandersleyen, AT, 74.) W. McLeod, in his study of the archery equipment from KV 62, attributes original ownership of some of Tutankhamen's bows to Smenkhkare (CBTT, 11, n. 1 and no. 4), and Reeves supplies a list of other KV 62 objects (including various boxes, sequins, a scarab chain, a shawl, and decorative bangles) that were once the possessions of Smenkhkare (CT, 168-169). The usage of these objects in KV 62 indicates that the tomb of Smenkhkare had been utilized as a source of materials with which to augment Tutankhamen's own funerary furnishings, which may have been incomplete at the time of the young ruler's premature death. Any disturbance of Smenkhkare's original burial should have a significant bearing upon reconstructions of events in KV 55, the tomb in which his mummy was finally discovered. Strangely, in spite of its almost unanimous identification as Smenkhkare, the implications of the connection between the KV 55 mummy and the KV 62 Smenkhkare objects have never been explored. These objects have been overlooked as possible clues to events in nearby KV 55. They were described as "heirlooms" by Carter, and Reeves discerns in this assemblage an additional category which he only defines as unused "surplus funerary equipment" that had been stored away for future use (CT, 168-169; DRN, 49.) But actual evidence is lacking to prove that these funerary furnishings were never utilized by their original owner. There seem to be no practical reasons why these items, some of them lavish and costly, should not have been used in Smenkhkare's burial, nor were there any apparent taboos in the ancient Egyptian religion prohibiting the reuse of objects which had actually been used in earlier interments. Notable examples of Egyptian monarchs appropriating the used grave goods of previous rulers can be cited. Pinudjem I reused the coffins in which Tuthmosis I had been buried (MiAE, 230) and Psusennes appropriated Merenptah's inner sarcophagi for use in his own burial. (MiAE, 262.) It appears that Carter's original designation of the Smenkhkare KV 62 grave goods as "heirlooms" has influenced all subsequent discussions of these objects, and it is usually taken as axiomatic that they were never employed by Smenkhkare. However, this accepted premise lacks supportive empirical evidence and may be easily challenged. A less complicated solution to the problem of the KV 62 Smenkhkare coffin would propose that Smenkhkare had actually been buried in it. The coffin, which measures just over two meters in length (ToT, 249, pl. LXVIII) could have once easily contained the KV 55 coffin, which Daressy measured as 1.75 meters in length (ToQT, 16, no. 4.) Its colorful inlaid rishi design is quite similar to that appearing on the KV 55 coffin, and the two--in spite of the differences in wig style, and the fact that they were made for two different people, one of them being the female Kiya--would have complimented each other in an aesthetically pleasing fashion. Smenkhkare's transitionalist political/religious stance would have enabled him to accept burial in an outer coffin incorporating religious motifs that had been rejected by the earlier, more fundamentalist version of the Atenist faith. A need to reuse this coffin and some of Smenkhkare's other funerary equipment arose when Tutankhamen died, probably prior to the completion of the young ruler's funerary ensemble. It seems reasonable to date a proposed reentry of Smenkhkare's original tomb, and the subsequent removal of his mummy and burial equipment into KV 55, to this time. Such an action could only have occurred under the direct orders of Ay, a ruler normally not given a part in the currently-accepted KV 55 reconstructions. Ay could have taken advantage of the reopening of Smenkhkare's tomb to conduct a general round-up of grave goods from other Amarna royal burials. A general salvaging operation of this sort perhaps explains the presence of some of Tiye's burial equipment and Akhenaten's magical "bricks" in KV 55. Ay's men, possibly finding the sun king's tomb in shambles in the wake of reprisals by the Amen priesthood, would have gathered up the few undamaged items that remained, including the magical "bricks" (which may have had their amuletic figures still in place at this time.) As part of Ay's general dismantling of the Amarna period royal burials, Smenkhkare's mummy bands, outer coffin, canopic "coffinettes," and other objects, were appropriated for reuse in KV 62, and his inner coffin and mummy were left in KV 55 with Tiye's deposit and the meager remnants of Akhenaten's burial. Numerous clay seal impressions were found in KV 55, five of which bore the prenomen of Tutankhamen (cf. Ayrton, ToQT, 10; DRN, 44, n. 160, and pl. II, no. 8, 10, 12-14. ) Reeves and Aldred both assume that these seal impressions indicate that Tutankhamen, sometime during his short tenure on the throne, had employed KV 55 as a cache for the reburial of some of his relatives. However, persuasive evidence found in KV 62 indicates that the KV 55 deposit should be dated later, to the time of Tutankhamen's burial. Reeves notes that four of the KV 55 clay seal impressions were made by the same seal ring used to make ten type "N" seal impressions in KV 62 (DRN, 44, n. 161; 64, 66, item N. Compare with seal impression from KV 55, CT, 20.) Reeves, however, dates the employment of the type "N" seal ring used on objects in Tutankhamen's tomb to a time preceding the boy king's death. He bases this dating on the fact that two of the type "N" seal impressions were found in KV 62 in conjunction with type "M" seal impressions which he argues would not have been used after Tutankhamen had died. 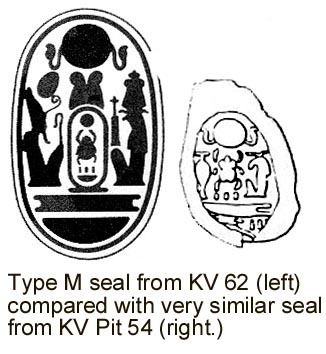 However, Reeves' opinion that the type "M" seal would not be employed after Tutankhamen's death is contradicted by the fact that a seal impression of very similar appearance was found in an undoubtedly funereal context in KV Pit 54, along with refuse material from the boy king's mummification and funerary banquet. 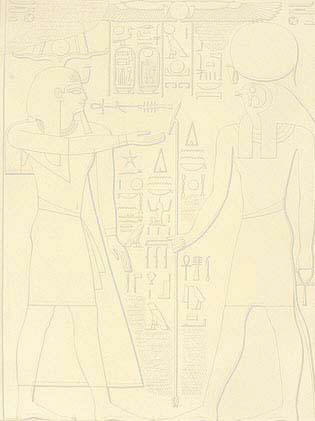 (Click here for a drawing of the Pit 54 seal impression, from CT, 39.) 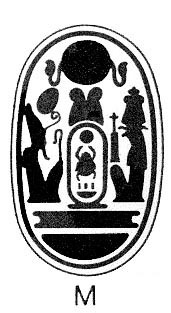 The iconography of the type "M" seal supplies further evidence that it possessed a funerary significance: its depiction of the gods Re and Osiris facing each other is a standard motif in Egyptian funerary texts and signifies the point in the nightly solar journey through the Underworld when the sun god meets and unites with the ruler of the dead. (HE, 119ff. 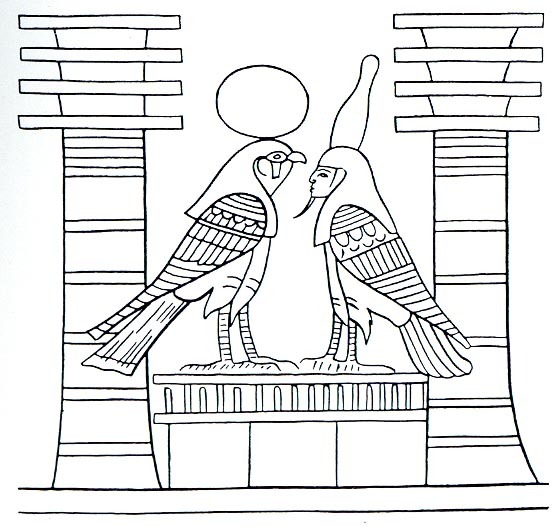 See especially p. 121, where Hornung gives an illustration of this motif from Ani's Book of the Dead.) The combined Re-Osiris imagery provides a metaphor for the death of the Pharaoh and his identification with Osiris, and the appearance of Tutankhamen's prenomen between these two deities on the seal impression would seem to indicate that the young king had died. The type "N" seal also seems to derive from a funerary context. 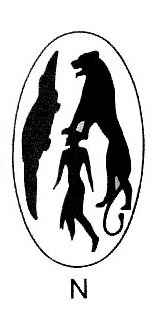 Its usage of the figure of a lion subduing a captive human is similar to the Anubis-over-nine-captives motif used on the Royal Necropolis seal, and its employment of the crocodile image suggests a kinship with symbolism appearing in the Litany of Re (HE, 76, 95, pl. 57), a funerary text used to decorate the walls of many royal tombs in the Valley of the Kings. In view of the obvious funerary connotations possessed by these seals, the most likely significance of identical type "N" seal impressions in KV 55 and KV 62 is that activities took place concurrently in both tombs during the preparation of Tutankhamen's burial. The remaining fifth seal impression of Tutankhamen found in KV 55 could have been associated with Smenkhkare's original interment, attached to a funerary gift given to him by his younger brother. We know that participation in the deceased king's funeral was an integral part of the rituals designed to legitimize the succeeding king's claim to the throne (cf. Frankfort, KG, 110-122.) Tutankhamen, although only a child, would have played a major role in Smenkhkare's funeral, and it is conceivable that some objects buried with the deceased ruler would bear the name of his successor. Such an object could have been moved into KV 55, along with the coffins and mummy of Smenkhkare, at the time of Tutankhamen's death, when a need arose to reuse some of Smenkhkare's funerary goods. A combination of rough handling and water damage could have caused the seal to drop off the object to which it had been attached, thereby obscuring its original significance. KV 55 might not even have been slated for use as a cache, at least not in the same sense that DB 320 and KV 35 were used (i.e. as a place for an official "repetition of burial," or whm krs.) The tomb could have been primarily a work station established by Ay to recycle grave goods for use in Tutankhamen's burial, a procedure that would have been greatly facilitated by its close proximity to KV 62. Smenkhkare's appropriated grave goods had to be refurbished at some location within practical traveling distance from Tutankhamen's place of burial. Near-by KV 55, the tomb in which Smenkhkare's mummy was eventually found, would have provided a very convenient spot for this type of operation. The presence of Tiye's funerary equipment in KV 55 might merely indicate that some of her grave goods were also targeted for recycling, and not that the tomb had been selected as the spot for her official reburial. It is quite conceivable that her mummy had never been present in KV 55 at any time. Aldred's belief that Tiye's pall and wooden shrine had actually been reconstructed over her coffin in KV 55 (AKoE, 206ff.) is based on the very tenuous evidence that a single rosette, similar to the ones found on Tutankhamen's pall, was discovered in the tomb. Assuming that this rosette actually came from a pall, its discovery in KV 55 indicates only that a pall had been present in the burial chamber at some time, and does not necessarily demonstrate that the pall had been put in place over a coffin within a reassembled shrine. It is tempting to wonder what a close comparison of the KV 55 rosette with those found in KV 62 might reveal. Such an examination might discover some interesting facts about the source of Tutankhamen's pall. The death of Ay only a few years after Tutankhamen's interment may explain why Smenkhkare's coffin and mummy were abandoned in KV 55. Any plans which Ay may have entertained concerning a more appropriate reburial for Smenkhkare would have died with him, since Horemheb, the succeeding monarch, would have shown little interest in the fate of the ephemeral Amarna ruler's remains. Although nothing conclusive can be stated at this time about Smenkhkare's original place of burial, some tentative speculations may be ventured. As Akhenaten's co-regent, Smenkhkare most probably had begun a tomb at the new royal necropolis at Akhetaten. His co-regency was brief, and his tomb at the Amarna capital was most likely abandoned in favor of one at a Theban location, especially in view of Smenkhkare's position of appeasement toward the reinstated Amen cult. He may have taken over WV 25, the Theban tomb begun by Amenhotep IV, and left unfinished by this ruler after his name change and move to Akhetaten. (For identifications of this tomb as Amenhotep IV-Akhenaten's, see Elizabeth Thomas [RNT, 83], John Romer [TVK, 59], and C. N. Reeves [DRN, 40-42; AEFP, 127]). In a 1979 report of his excavations in WV 25 (ASAE 63 , 164ff. ), Otto Schaden recorded finding fragmentary remains of traditionally royal funerary objects (small parts of a flail made of wood, fragments of royal ureaus serpents and guardian statues) which dated to a time earlier than the eight 22'nd Dynasty intrusive burials found in the tomb by Belzoni in 1817. (The Theban Mapping Project website dates these objects to the 18'th Dynasty, thereby strengthening their possible connection to Smenkhkare.) These could indicate that the tomb had once contained a royal burial. The abandoned tomb of his deceased senior co-ruler would have provided Smenkhkare with a convenient burial option, already partly constructed deep in the Theban heartland of the Amen cult. Perhaps the fragments of royal funerary equipment found by Schaden in WV 25 originally belonged to Smenkhkare, and represent objects that were left behind, for reasons unknown, by those who conducted Ay's postulated Amarna grave goods recycling campaign. Nicholas Reeves is currently engaged in excavation work in the Valley of the Kings, motivated largely by the conviction that other members of the Amarna royal family are cached in the Valley. (Go directly to the website of Nicholas Reeves to learn about breaking developments in the Valley of the Kings.) Discoveries which these excavations might make probably offer the only real (although slim) chance of finally resolving questions about KV 55 and its mysterious occupant. To learn about objects that were stolen from KV 55 and how some of them have been rediscovered, see KV 55's Lost Objects on the menu bar at left.